A shimmering dragonfly glides gracefully over a path of beaded berries and flowers. This beautiful necklace is made using very basic bead embroidery techniques and finished off with simple stringing. 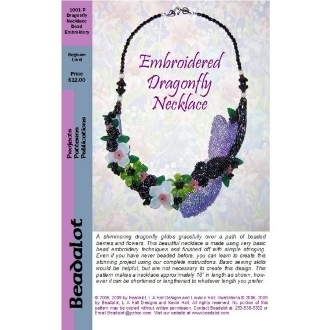 Even if you have never beaded before, you can learn to create this stunning project using our complete instructions. Basic sewing skills would be helpful, but are not necessary to create this design. This pattern makes a necklace approximately 18” in length as shown, however it can be shortened or lengthened to whatever length you prefer.